THIS WAS THE SECOND TVR RACING CHASSIS TO BE BUILT AND THE 2ND JOMAR MKII TO BE BUILT. THE CAR WAS ORIGINALLY ORDERED ON MARCH 13TH 1956. 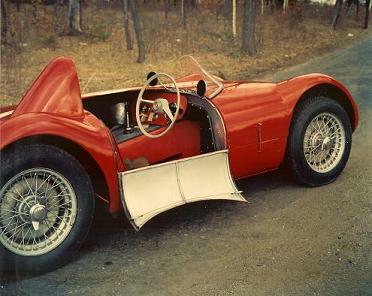 IT HAD ALFIN BRAKE DRUMS WAS CONFIGURED RIGHT HAND DRIVE, AND HAD A STAGE II 1100CC COVENTRY CLIMAX ENGINE. 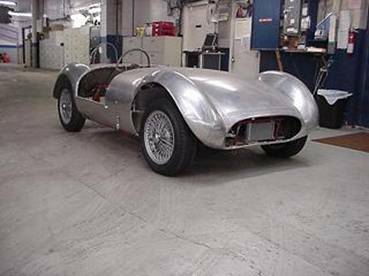 IT TOOK 4 MONTHS FOR THE CHASSIS TO BE BUILT WITH COMPLETION ON JULY 21ST 1956. IT WAS SHIPPED VIA THE AMERICAN PRESS ALMOST 4 MONTHS LATER DUE TO HAVING TO MODIFY THE SUSPENSION AS PER FAILURES ENCOUNTERED WITH 7C101. IT ARRIVED AT MSG ON NOVEMBER 12TH 1956. THE CAR WAS FITTED WITH AN ALUMINUM BODY AND WAS PAINTED RED WITH A WHITE STRIPE BY MID-JANUARY. A TOTAL BUILD TIME OF 10 MONTHS. ON MARCH 18TH, ALMOST 1 YEAR TO THE ORDER DAY, THE CAR WAS SOLD TO BOB COLUMBOSIAN. IT WAS RACED FROM APRIL 1957 UNTIL JULY 1958. IT RACED IN APPROXIMATELY 20 RACES AND WAS WRECKED AT LIMEROCK PARK ON 7/7/58, WHEN IT WAS HIT BY 7 CARS AND TOTALLED. FRAME HALVES AND FRONT AND REAR SUSPENSION, BRAKES AND STEERING ALL STAYED AT MSG. FURTHER ON JUNKED CHASSIS (11/94) DERICK DURST HAD FOREIGN CARSHOP, DIGHTON MA (1970'S) HAD "JOMAR" REAR END AND SOME TUBULAR ALUMINUM PARTS. THE ENG # FWA400-6-6811 ENDED UP IN LOTUS X1*1. CURRENTLY THE CHASSIS HAS BEEN REFITTED WITH NEW FRONT AND REAR TORSION TUBES. THE ORIGINAL ARMS, AND BRAKES HAVE ALSO BEEN REFITTED. THE ORIGINAL REAR AXLE WAS PURCHASED THROUGH WALT ARMSTRONG. CURRENTLY TRYING TO PURCHASE THE ORIGINAL ENGINE BACK. THE ORIGINAL BODY PANELS WERE GIVEN TO BOYD ALONG WITH HIS CHASSIS AND BODY PANELS FROM 7C101. NEW REPRODUCTION PANELS ARE BEING ASSEMBLED NOW. This first picture in red is the car just prior to delivery to Robert Columbosian.